For a long time, the Congressional Budget Office’s forecasts for the U.S. national debt have been considered to be the most accurate of all national debt projections. But with the national debt growing so fast in recent years, it appears the CBO is having a very difficult time in keeping up. The accelerating growth of the national debt has outpaced Congressional Budget Office predictions up to 10 years, according to George Mason University. This chart compares Congressional Budget Office (CBO) long-term projections of the debt held by the public as a percentage of GDP, or the debt-to-GDP ratio. Public debt comprises over two-thirds of gross national debt, and is owed to individuals, businesses, and foreign and state/local governments. In the five years between the long-term projections calculated in 2012 and 2007, public debt milestones have moved up by nearly a decade on several occasions. 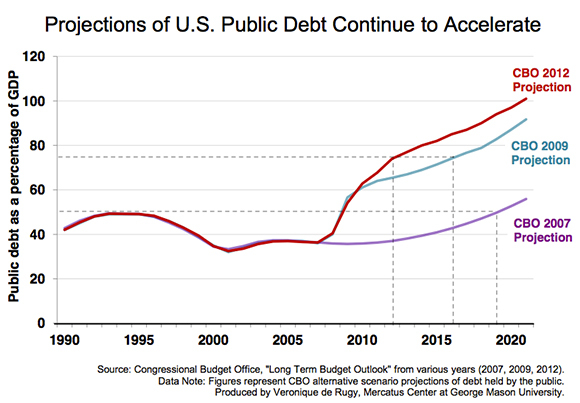 In 2007, the CBO projected that public debt would equal up to half of total U.S. economic output by 2019. In reality, public debt-to-GDP passed this milestone in 2009—ten years ahead of the CBO’s 2007 projection. Importantly, the long-term projections used in this chart come from the CBO’s alternative scenario, which incorporates policy changes that were likely at the time. Hence, this is a more realistic projection than the CBO’s baseline scenario. U.S. debt was half of the country’s total revenue in 2009, 10 years ahead of the 2019 prediction set by the CBO in 2007. 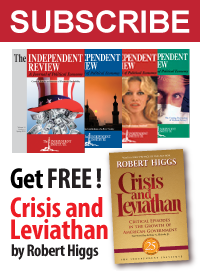 National debt is set to increase to 80 percent of GDP by 2014 according to the current projection by the CBO. This is set for five years before the projection given in 2009 and 13 years before the projection in 2007. One important thing to note is that the U.S. government’s publicly-held debt doesn’t cover the full debt liabilities of the U.S. government. The total national debt also includes the obligations owed to Social Security, which will increasingly need to be paid from issuing regular publicly-held debt as that program is already running increasingly severe operating deficits. Or in other words, the United States’ debt situation is worse than these figures indicate.